Imagine no more lost keys or trips to the locksmith ever again. With a digital door lock, you can enter a custom code into a touchpad instead of turning a key or swiping a card to get into your home or business. This setup allows you to set up unique access codes for family, friends, employees, neighbors, or guests. Some systems even incorporate voice control and other advanced features. What are some of the most important features of the best digital door locks? Let’s find out. 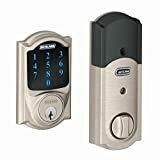 When you are shopping for a digital door lock, make sure that the door lock you are thinking of purchasing will fit the size, type and material of your door. Some door locks fit only on right- or left-hinged doors, while others fit on both. Certain locks are ideal only for indoor use, while others may be rugged enough for outside doors. Many digital door locks are designed to fit most or all standard doors, but others may only fit specific sizes of doors. Digital door locks sometimes include smart control features, which means that you may be able to control your lock—and thereby access to your home or office—using a smartphone or tablet. You might even be able to connect to Alexa or another personal assistant device for voice control. Make sure that if these features appeal to you, you are choosing a door lock which will be compatible with your devices. One of the most useful things about a digital door lock is that they can store a variety of access codes. Instead of relying on just one key to secure your premises, you can set up personalized codes for different users. While some locks store just a few codes, others have the capacity for dozens. So think about how many access codes you will need and how often you will be changing them before you pick a digital lock. Most digital door locks are battery powered. This tends to make them easier to install, since no wiring is required. That does mean however that you are relying on the battery so that you can get in and out. If the battery runs out, you will have no way through the door, unless there is a backup key (which is another nice feature to look for). For that reason, you should look for a digital door lock which includes a low battery indicator and a backup charger. With the indicator, you can see when it is time to change the batteries. But if for whatever reason you miss your window, the backup charger will provide you with a little extra juice. That way you never have to worry about being locked out of your own premises. 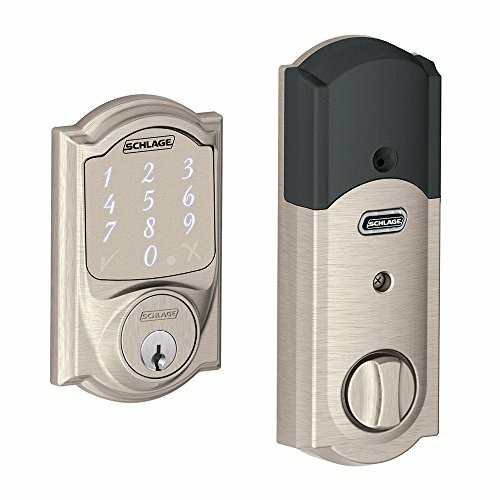 Schlage is one of the biggest names in locks for a reason. The company produces some of the finest digital door locks in existence. Take for example the popular Schlage Sense Smart Deadbolt. This digital door lock can be purchased in several different beautiful finishes, perfect for complementing any door and trim. So long as you have a standard pre-drilled door, the lock should be compatible. This lock is compatible with Android smartphones as well as iPads, iPhones, and iPod Touch devices. Just download the Schlage Sense app and purchase and install the Schlage Sense Wi-Fi Adapter to control access to your home or business from anywhere with a wi-fi connection. The lock includes a low battery indicator to let you know when it is time to switch out the batteries. A backup key is provided in case you do run out of battery. It only takes around 5-10 minutes to install the lock. The instructions are simple and complete. There is a 3-year warranty on the electronic components of the lock and a limited lifetime warranty on the finish and the mechanical parts. There are some issues with remote access if you are outside the reach of your own home network. For one thing, you need an Apple TV. For another, some users report difficulties getting remote access to work even with the right technology. Many users however did not have any problems. This is one potential flaw in an otherwise outstanding lock. The pros certainly outweigh the cons. 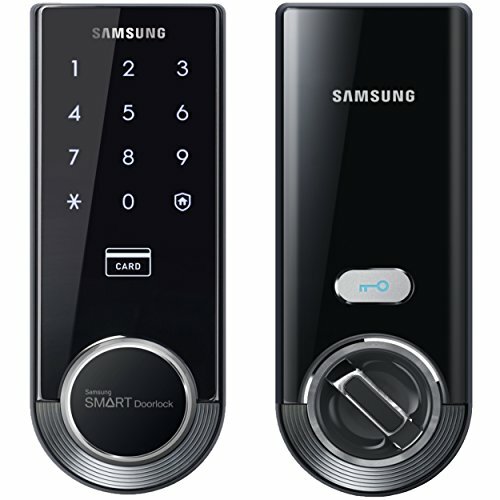 Samsung Ezon SHS-3321 digital door lock is another excellent option to consider. It has a very sleek look to it and some great features like an adjustable deadbolt which makes it adaptable for a range of different doors. That makes it a versatile solution in a range of situations, whether you are trying to protect a home or a business. Fit the Samsung Ezon SHS-3321 onto a variety of different doors. This device includes an external emergency battery terminal. The battery life is approximately 10 months. Includes a burglar alarm as well as a fire detection sensor. Along with a master password, you can store up to 70 user cards/PIN codes. Combinations can span anywhere from four to 12 digits, so you can set the security level which satisfies your needs. If need be, you can hand out codes to a number of different users. This lock is fast and easy to install. It is perfect for both interior and exterior doors. You cannot use apps or Wi-Fi to access and control the lock. So if you are looking for smart lock features, you will need to shop elsewhere. Then again, if you are purposely shopping for a lock which isn’t connected to the net, this is perfect. 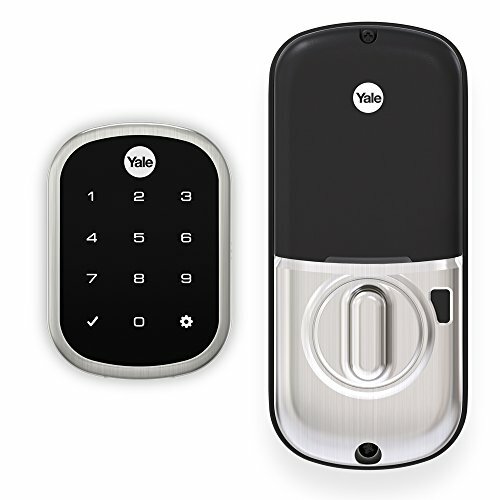 Those who are in the market for a smart digital lock may want to think about the Yale Key Free Touchscreen Deadbolt. This popular door lock has an elegant, beautiful design, and will look great on any door. It has received some glowing recognition; indeed, Yale was voted the #1 Smart Door Lock Brand for 2017 by CEPro. The Yale Key Free Touchscreen Deadbolt is compatible with Amazon Alexa if you purchase Wink or SmartThings to go with it. That means that you can use voice control with your lock. You can set as many as 25 different PIN codes. Each code can range from four to eight digits, so you get to choose the level of security that you want. Shorter codes may be useful for small children who cannot remember longer ones. Longer codes are great if you want to make your security harder to crack. Installation is fast and easy and requires nothing more than a standard screwdriver and a face bore hole and backset. You can use this deadbolt on any standard door measuring 1 3/8″ to 2 1/4″ thickness. There is a 9V battery backup charger included, preventing lockouts. The strike plate is a bit flimsy, so this lock has a structural weakness. Aside from that, it is top-shelf, boasting plenty of excellent features. The great news is that you can easily replace this strike plate, making the lock even stronger.